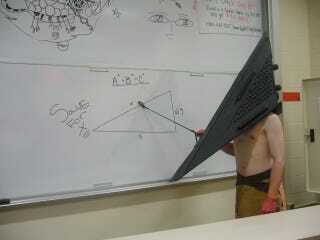 Silent Hill's resident bogeyman Pyramid Head ask the class to solve for X using the Pythagorean theorem. Known as "Sankaku Atama" ("Triangle Head") in Japan, Pyramid Head first appeared in Silent Hill 2. And now he appears in a classroom.